Nine to mix and match for a hike or mountain bike ride beginning at the Park City Resort base area. 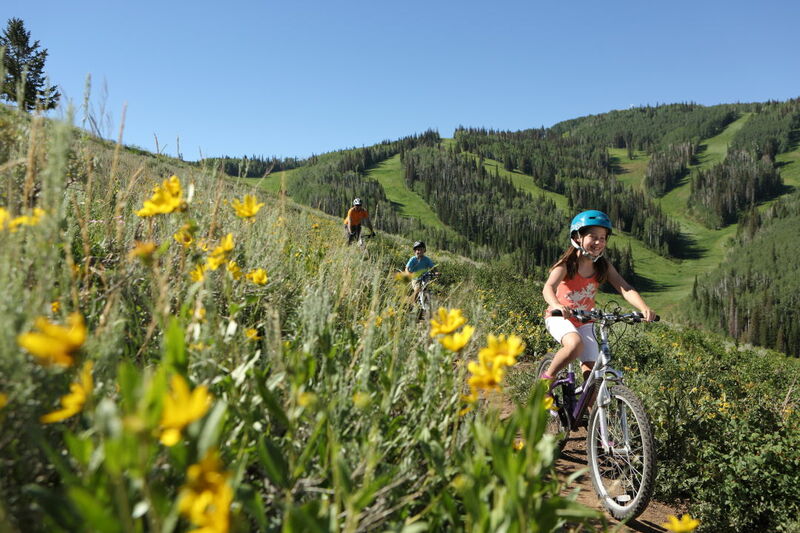 Both summer and fall are the seasons for hiking and biking in Park City. There's literally hundreds of miles of trail in and around the city, weaving through rolling hills of sage and climbing up through aspen groves on mountain sides. There's something for every level of hiker and biker out there, making this an ideal family activity. Here's nine of our favorite trails, all easily accessed from the Park City Resort base area. Mix and match 'em to your hearts desire. With any luck, you might spot a deer, moose, or even a mountain lion. One of the most popular trails in Park City, the Armstrong Trail climbs consistently up the mountain from the Silver Star base area for four miles, rising 1300 vertical feet. It's a mixed use trail, but bikers may only ride uphill, meaning you'll need to connect to another trail to get back down. A good choice to return to the Silver Star base is Spiro, a 3.1 miles of consistent-grade trail through aspens and patches of wildflowers. Beware: despite ample SLOW signage, mountain bikers tend to descend quickly on this buttery-smooth singletrack. If you're looking to avoid other users, opt for early morning or late afternoon. You can access it from Armstrong via the short HAM Trail connector. A ideal trail for the beginner mountain biker, Jenni's trail is also a good one to hike and is generally recommended if you're making a descent from the top of the PayDay or Town Lifts. This is 5.1 miles at a moderate grade and a wide singletrack trail. Mountain bikers can easily connect to make longer loops via Mid Mountain Trail. This well-established single-track trail is probably one of Park City's most well known. It traverses 20 miles of mountains at around 8,000 feet, running from Deer Valley's Silver Lake Lodge to the Summit Park neighborhood. Several trails connect so hikers, and especially bikers, have lots of options for making loops. Skirting along the Crescent Ridge, the Mojave Trail begins at the Viking Yurt and is a short 1 mile, multi-use trail. It crosses ski runs at a consistent grade down toward the Mid Mountain Trail. Keep your eyes open for sweeping valley views and wildflowers, as well as bikers zipping by. If you're looking for a consistent grade across wildflower filled ski runs, then the 3.9-mile CMG trail is for you. Duck in and out of aspen groves and watch out for the intersections to Jenni's Trail. Loose Moose is a 1 mile section of trail, starting just underneath PayDay Lift. If you hit this trail, remember it's only downhill for both hikers and bikers. It's a mellow downgrade on a few switchbacks close to the Alpine Slide that's easy to connect to either Jenni's, CMG, or Mid Mountain Trail. One of the trails connecting to Mid Mountain, this wide banked, single-track trail can be accessed easily from the Crescent Lift. The trail is a short 1.5 miles through beautiful vegetation and aspen tree groves. If you connect this trail with Mid Mountain, you can easily grab the Town Lift back to historic Main Street. If you'e looking for a little bit of the best Park City has to offer for hiking, then try out this combination hike. From the top of Town Lift make your way back down the 3.4 miles to the base by weaving through aspens along Sweeney's Switchbacks. Watch out for roots and rocky sections, especially if you're on a bike. Still not enough trails to satisfy your adventurous spirit? There's plenty more hiking and mountain biking opportunities in the surrounding area.